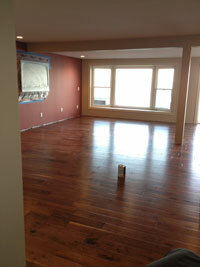 John's floor from Harman Hardwood Flooring! John had a project that was to be a simple quick one...Hahaha,,if you know John that never happens! To make a short story out of a really long one,,he needed to replace his flooring. Now, nothing short of beautiful will do so he and his wife headed to Harman Hardwood Flooring. They picked out the perfect one! Hallmark Heirloom Walnut! Harman Hardwood has an amazing selection of all kinds of wood, light or dark whatever suits your taste they have it. Here is just a sample list of what they have available. But still there are so many more! Click here and check them out on Harman Hardwood's website to see the rest! Head over to their showroom and see their wide selection!